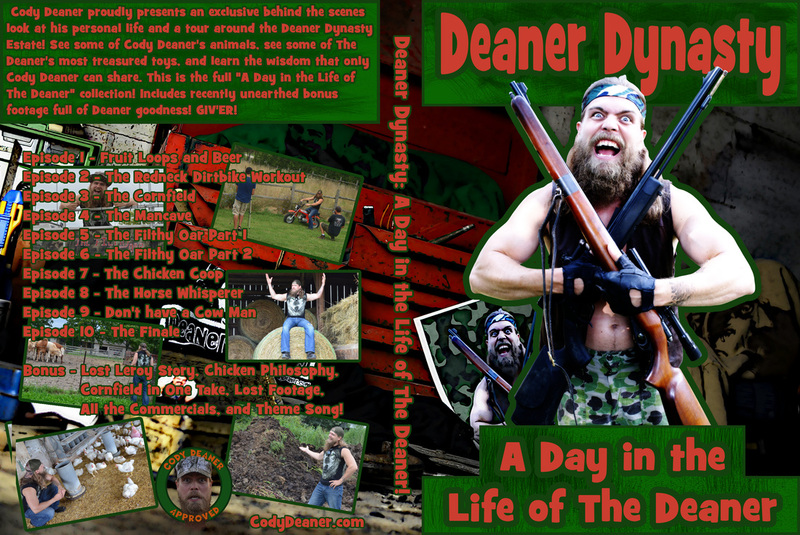 You can purchase the FULL-LENGTH DVD release of "A Day in the Life of The Deaner" in the Online Store. It comes with tonnes of BONUS FOOTAGE never before released, including a blooper reel you have to see to believe! "Deaner Dynasty: A Day in the Life of The Deaner"
In the series finale, we take a look back at the exciting day that was for The Deaner. Be sure to watch the end of the episode for an exciting announcement about a future release of the web-series. We've hit the last stop on the tour of the Deaner Dynasty Estate! It's time to meet more of Deaner's flock of animals ... his cows! Hear the affectionate names Cody gives his cows, another funny LeRoy story, and why Cody loves his cows so much. In this week's episode, Cody Deaner introduces us to his horses - affectionately known as #1, #2, & #3. He tells of his buddy LeRoy riding his horses, the beauty of horses during mating season, and shows why he is sometimes known as "The Horse Whisperer." In this week's episode, Cody Deaner shows us his chicken coop. He introduces us to a few of his favorite chicken friends, discusses his views on animal rights, and tells us the rules of his chicken coop. All done in only the way Cody Deaner can do it! This week's episode is a follow up to last week's episode on The Filthy Oar. In this week's episode, Cody Deaner finally gets a blade of grass to help him sing a song about the peace and tranquility that is The Filthy Oar! So sit back, relax, and let The Deaner serenade you with a medley about the manliest boat on the raging seas ... The Filthy Oar! All aboard The Filthy Oar! In this week's episode, Cody Deaner shows you his wicked-awesome boat ... The Filthy Oar! He explains why riding in his boat and spending time by the riverside is a relaxing time for him. Cody also shows you how to play a relaxing tune on a reed ... well, tries to anyway. In this week's episode, Cody Deaner shows us his ManCave! And, it's not your typical ManCave either. Why? Because The Deaner is digging his own! Cody explains why he is digging a ManCave, what the MANpoints system is all about, and why he is a downright wicked-awesome man. WARNING: This episode is full of MANliness. In this week's episode, Cody Deaner takes his fans on a trek into the abyss that he calls "peace and tranquility" ... his cornfield. The only issue is ... getting out of the abyss! In the premiere of Deaner Dynasty: A Day in the Life of The Deaner, Cody finally wakes up and gives the audience a glimpse into his life, his eating habits, his love of artwork, and even his bedroom!